Over-sized 'Classic 6' Facing Hudson River at Elegant 100 Riverside Drive. Large gallery opens to a gracious, sunny living room featuring a wide picture window with westerly views to the Hudson River. 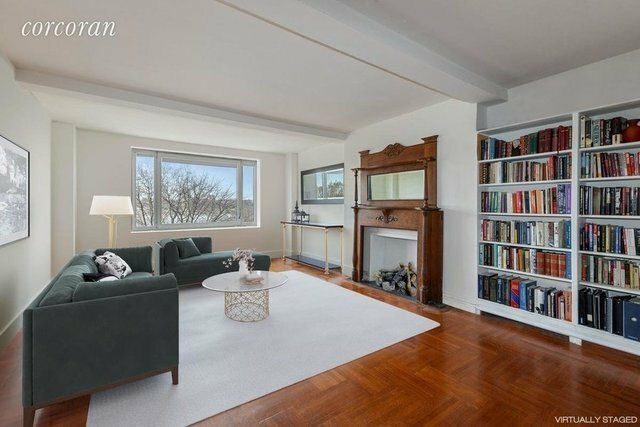 This spacious living room also includes a decorative fireplace and built-in bookshelves. Across the gallery from the living room is a massive dining room with another large window and generous room size that offers a myriad of options including traditional formal dining, a great room or potential as an additional bedroom. The spacious master bedroom and ensuite bathroom also have beautiful river facing views. The full master bath includes a separate bathtub and shower. Also, in the bedroom wing, the second chamber includes a picture window and over-sized closet. A second full bathroom in the hall is nicely sized. The wonderful windowed eat-in kitchen includes a large gas range, dishwasher and washer/dryer that easily vents out. There is also a generous separate pantry/utility room. In addition, this section of the apartment has a well-proportioned staff room that can be used as a small bedroom or office as well as a third full bathroom including a proper bathtub with shower. Gracious rooms and plenty of them, make this apartment a real home with room/s to spare.Beautiful hardwood floors and high, beamed ceilings run throughout this lovely home. Bathrooms have all the original art deco tile and details intact. There is an assessment of $445.00. 100 Riverside Drive is an elegantly designed Art Deco cooperative on the corner of 82nd Street. Building amenities include full-time doorman, resident manager, gym, bicycle room and storage as available. 75% financing and pets are allowed with board approval.